Nikon F3/T with Nikon Bellows PB-6 + PB-6E (extension bellows) + Micro-Nikkor 2.8/105 mm. From the first moment when Nikon introduced photo cameras and lenses it provided the photographer with close-up equipment. 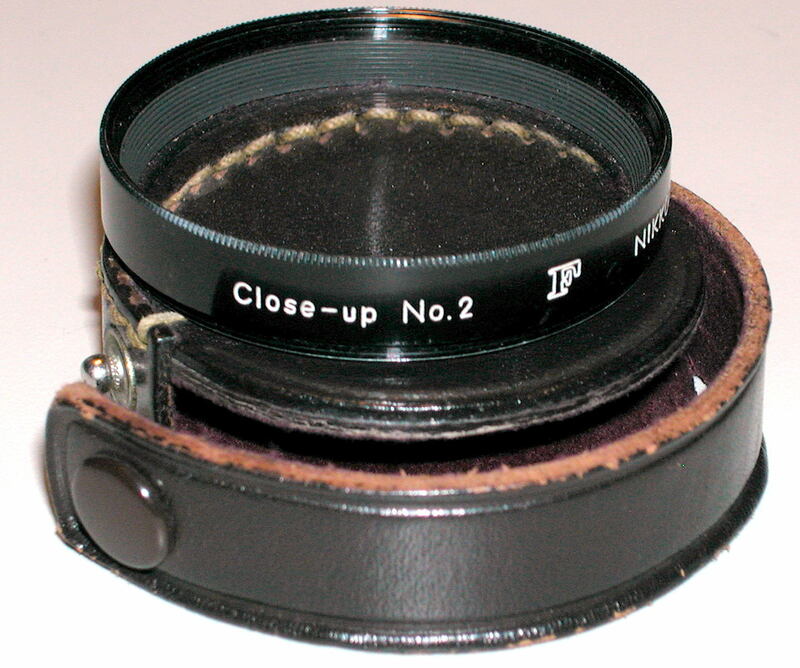 For the rangefinder cameras various close-up lenses were offered plus a bellows to be used on an additional reflex housing. For the reflex cameras various equipment was and still is offered. Photographers can choose from close-up lenses, macro-rings, bellows and special lenses. Besides the equipment Nikon provided, other manufacturers offered lots of items to be used on Nikon cameras. It is impossible to list all equipment ever offered, as nobody knows what really exist. Nikon equipment is known from sales brochures and catalogues. 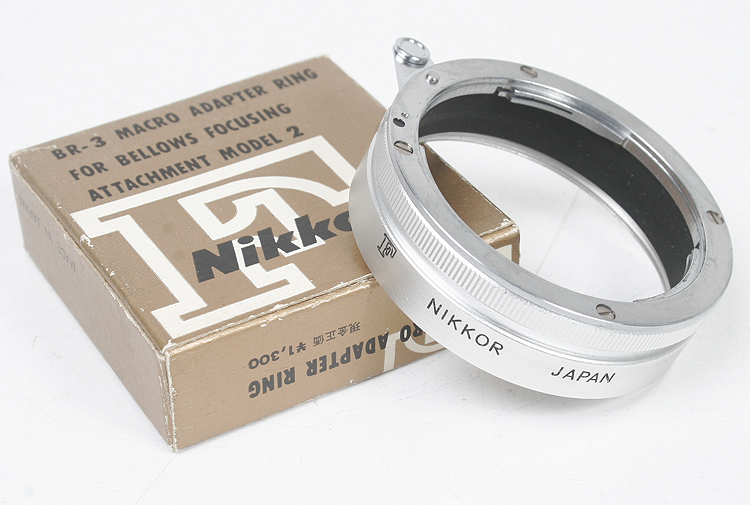 For two Nikkor lenses - to be used on Nikon rangefinder cameras - Nikon offered several close-up attachment lenses. Model A (see above) will fit a Nikkor 1.4/5cm. mounted on a Nikon I, M or S. Included in this close-up set is a frame which has to be attached to the accessory shoe enabling to watch the close focus through the rangefinder. This set makes it possible to focus down to 1.5 - 2.6 feet. Model B will fit a Nikkor 2/5cm, mounted on a Nikon I, S or M. Model C (see above right) will fit the Nikkor 1.4/5cm. 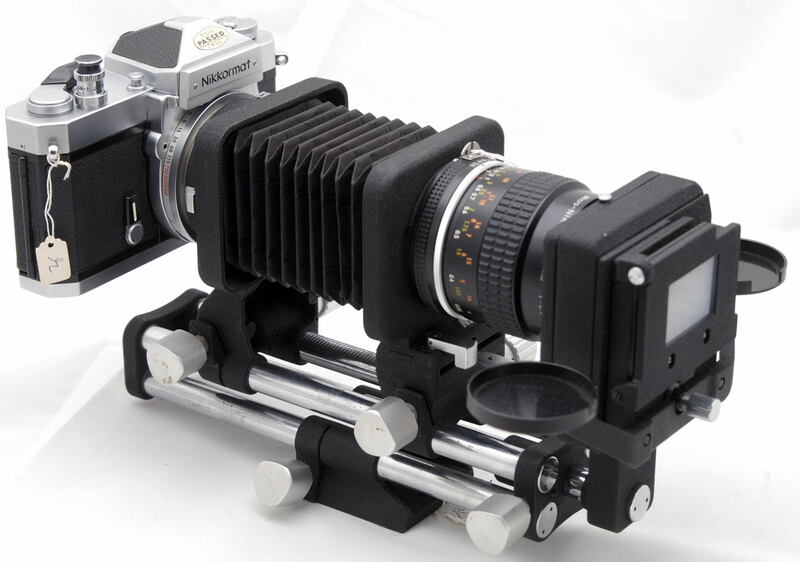 mounted on a Nikon S2 and Model D fits a Nikkor 2/5cm. mounted on a Nikon S2. For a Nikkor 1.4/5cm mounted on a Nikon S3, S4 or SP Model E (see above left) was offered. 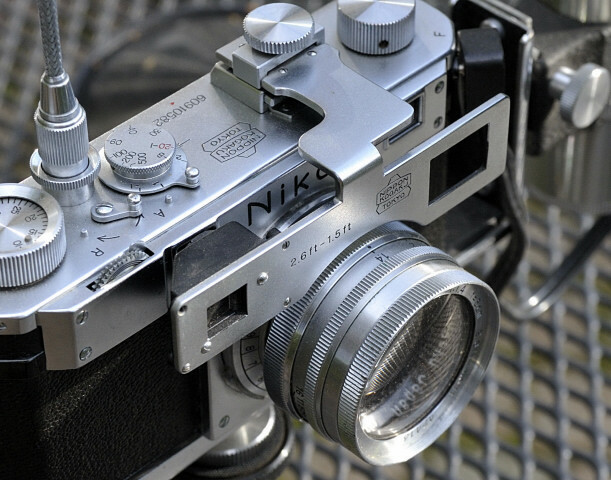 For a Nikkor 2/5cm., mounted on the same cameras Model F was offered. For the Nikon SLR cameras Nikon provided close-up attachment lens No. O, No. 1 and No. 2 (see above). These look basically like filters designed to work with lenses up to a focal length of 55mm. and with a filter thread of 52 mm. The refractive power of the No. O = 0.7, the No. 1 = 1.5 and the No. 2 = 3. These lenses can be stacked together for greater magnification, but the overall quality of the picture will decrease. Of a similar nature, but of a better quality are the two-element, achromatic corrected close-up attachments, to be used on normal and tele-lenses up to a focal length of 200 mm. Attachment No. 3T and 4T have a thread of 52 mm. Attachment No. 5T and 6T have a filter thread of 62 mm. The refractive power of the 3T and 5T is 1.5 and that of the 4T and 6T is 2.9. The greater the refractive power the closer you can get to the subject. Without any loss in quality and in light these lenses can be stacked together for greater magnification. The close-up attachment lenses for compact film, compact digital (Coolpix) cameras and movie cameras are of a different nature and are not listed here. Please visit the relevant chapters in the web site. BR-2 & BR-2A = to mount SLR lenses with 52 mm. 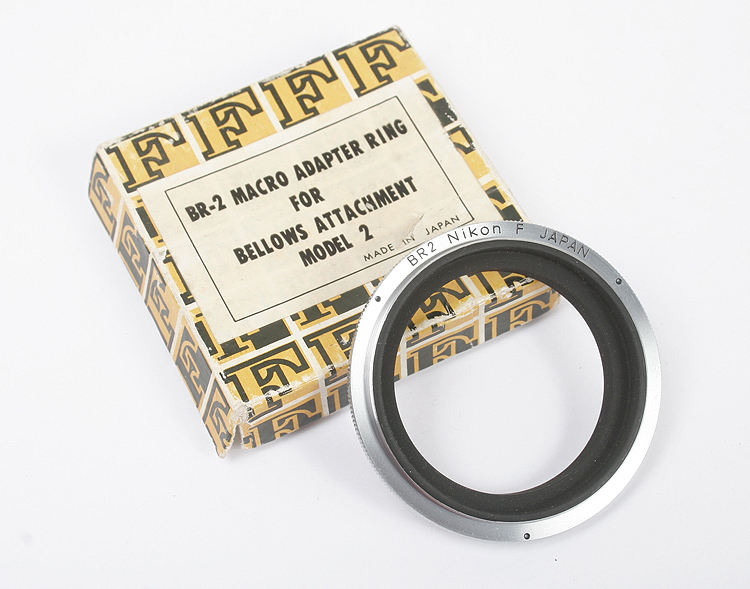 filter thread in reverse position; BR-2A for AF-lenses. BR-3 = to be attached to the bayonet of reversed lenses on a BR-2 and takes filters and hoods with a 52 mm. thread. BR-4 = together with BR-2 this ring enables to control aperture by cable release. The black button is release a lens, the white button to release the ring from the bellows and on top the cable connector. 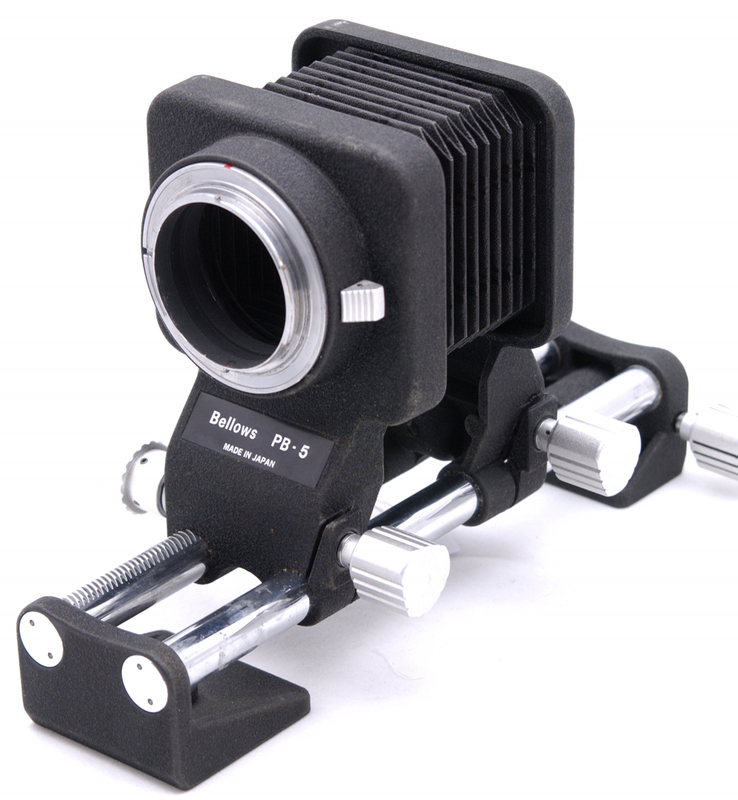 BR-5 = to mount SLR lenses with 62 mm. filter thread in reverse position on a BR-2/BR-2A. BR-6 = to be used like BR-4 but together with BR-2A. The very first and cheap extension rings for SLR lenses were the K-series. K-1 = 5.8 mm. ; K-2 = 5 mm. ; K-3 = 5.8; K-4 = 10 mm. & K-5 = 20 mm. Stacked together you´ll get a total extension of 46.6 mm. There is no meter coupling possible. When the Micro-Nikkor 3.5/55mm. was introduced it came with a M-ring (27.5 mm extension) permitting focusing up to 1:1. That ring was later replaced by the M2-ring. Both rings do not couple the exposure meter in the camera. For the Micro-Nikkor 2.8/105 mm. the PN-1 extension tube (52.5 mm.) is offered. This tube offers meter coupling, however. When the AI-mount was introduced the ring was replaced by the PN-11 (see below). The PK-series is a cheap but effective way to close focusing with regular SLR lenses. All PK-rings are meter-coupled. Their lengths are different: PK-1 = 8 mm. ; PK-2 = 14 mm. ; PK-3 = 27.5 mm. 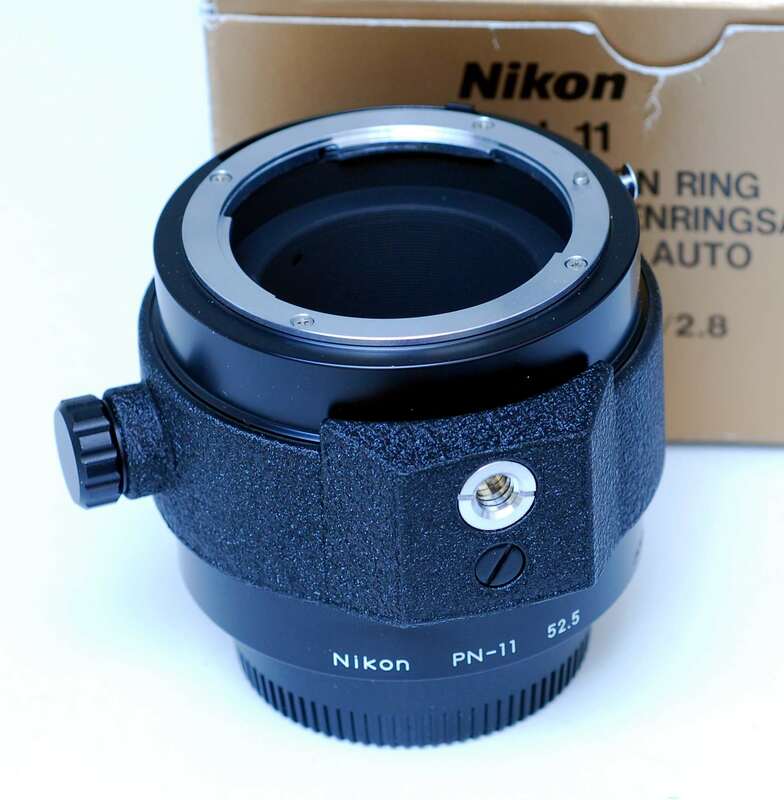 When Nikon introduced the AI-mount in 1977 for its SLR lenses the PK-set was replaced by a new range of PK-tubes: PK-11, PK-12 (see below) and PK-13, having the same extension. Modern AF-lenses can be used with the new set of PK-tubes, except the PK-11. The data transmitting contacts in the camera mount may cause short-circuit, so use the PK-11A only!! 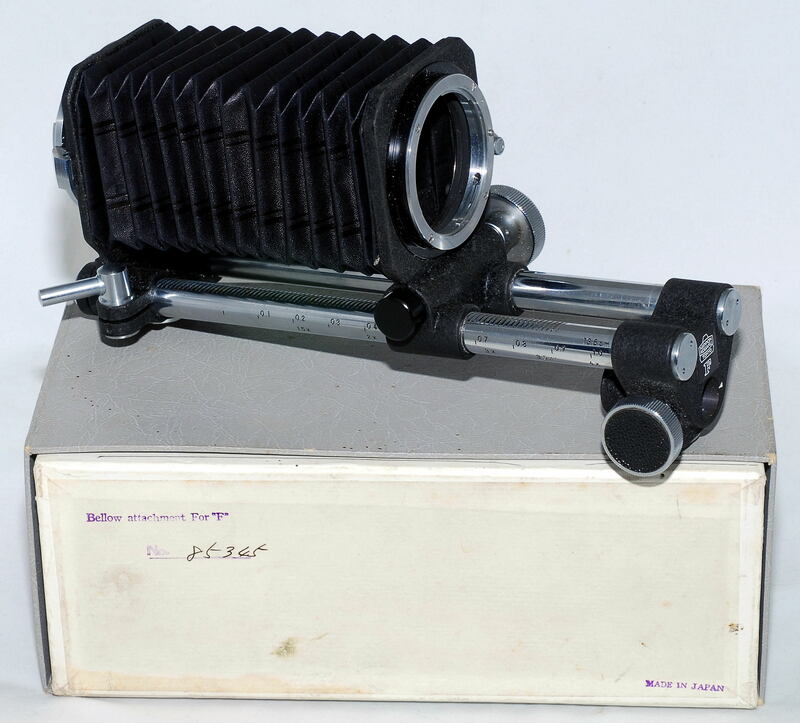 Nikon´s first bellows (see above) was offered for the Nikon rangefinder cameras. It has to be mounted on the rangefinder reflex housing as without it focusing will be impossible. This bellows was meant to use a special lens head (Bellows-Nikkor 4/135mm. ), but later two adapters made the use of other rangefinder (and even SLR-) lenses possible. All No. 1 bellows have a serial number, starting at 56000. Note: When using the bellows reviewed below on a modern SLR camera fitted with a motor drive or battery pack a macroring of at least 20mm. has to be mounted first. Mounting without that macroring will be impossible. The first bellows for the Nikon F came in a grey box with serial number. Later bellows came in golden/yellow boxes (see below). 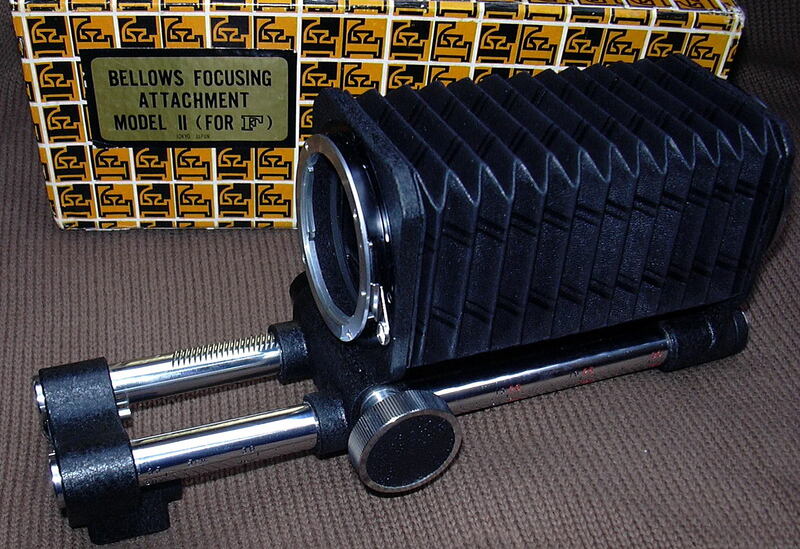 The first bellows introduced for the Nikon F-series. This bellows has a serial number as well, which makes it easy to determine whether your bellows will fit all Nikon F models. 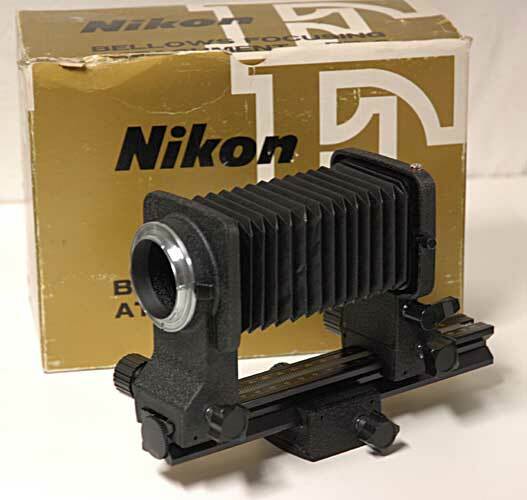 The problem with the very first bellows is that the Photomic and Photomic T finders have to be removed before the Nikon F could be mounted to the bellows. This was fixed on the second version by simply extending the mounting flange by 3 mm. The modified bellows II starts with serial number 106700. When the bellows is closed there is still 51.5 mm. of extension, which is why it starts at 1:1. On the rails markings are engraved corresponding to a Nikkor 2/50mm. and the Bellows-Nikkor 4-135mm. 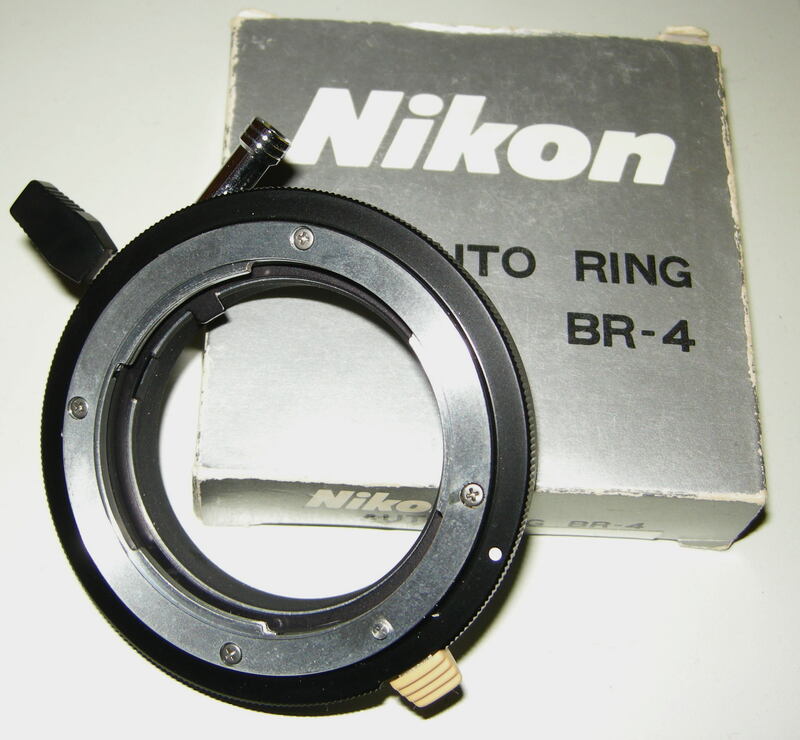 When this standard Nikkor is used in reverse (with BR-2) a magnification of 5x can be achieved. For this bellows a special slide copier was supplied, that works on this bellows only! This small bellows is a dovetail-grooved, octagonal shaped, single rail bellows with an extension range of 35 - 142 mm. 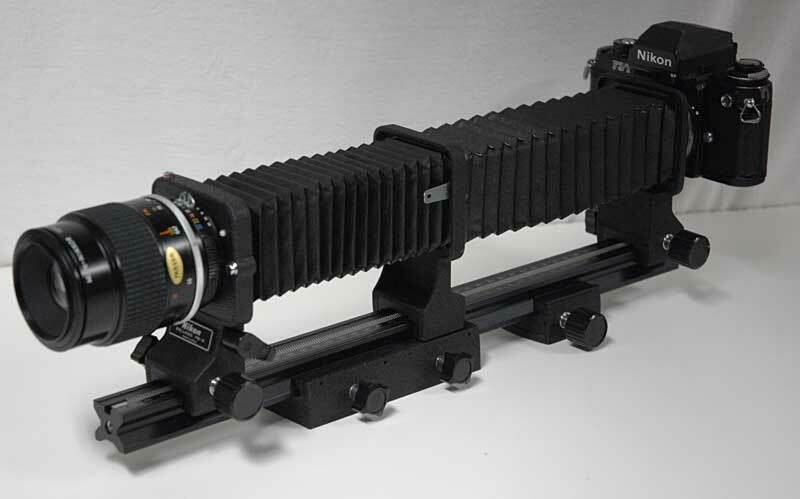 The bellows does not accept modern cameras, like the Nikon F4 and later models, and does not accept any slide copier or extension bellows. Nevertheless it is a very nice bellows for even handheld shooting. Among many photographers the PB-4 is regarded as the best and the most versatile bellows ever made by Nikon for its SLR cameras! It has a dual twin-rail system, allowing independent movement of the body and lens standards and of the entire assembly. The extension range is 43 - 185 mm. The geared movement of the lens and body standard as well as the tripod head makes magnification and focusing very accurate. The lens standard has 25° of swing and 10 mm. of lateral shift. A PS-4 slide copier was offered, although other/later slide copiers (PS-5) can be attached as well. The PB-5 may be seen as a simplified version of the PB-4. 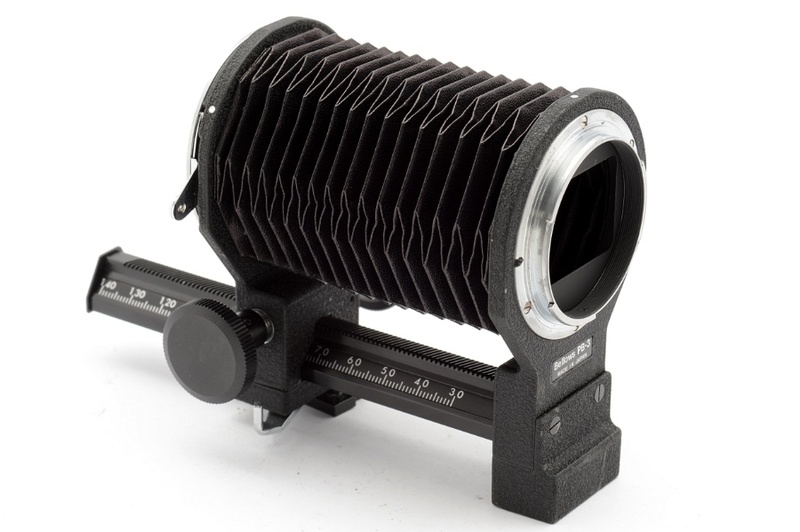 It has a single, twin-rail construction and has the same extension and magnification range as the PB-4, but lacks the movable (swinging and shifting) lens standard, nor an independent tripod socket. This bellows accepts the PS-4 and PS-5 slide copier. The PS-5 is similar to the PS-4 but without the slide trays. This bellows is in fact part of a modular system. It is a double-dovetail rail system, which allows independent operation of the camera body and lens standards and the entire assembly. The rail has an extension of 48 - 208 mm., which can be extended to 438 mm. via the PB-6E Extension Bellows. If attaching the extension bellows the lens standard has to be removed; it can be placed back on the PB-6E after the two units are assembled. The PB-6M slide copier (updated PS-4) allows slide duplication. The PB-6M macro copy stand is a small stand to be attached to the PB-6. It comes with opaque acrylic disc allowing direct or trans-illumination of the subject. Furthermore the PB-6 has a built-in semi-automatic diaphragm that requires a double cable release (AR-4), making the BR2/2A obsolete.